Thanksgiving weekend ushers in the season of outdoor holiday displays. Whether you are hoping to be the person getting his home gawked at or you're a "gawker" with great expectations, this is the year for extravagant holiday décor. Best magazine Senior Editor David Gregg has gathered a sample of the year's most outrageous holiday decorations that will be sure to cause a traffic jam this holiday season. He demonstrated the best for co-anchor Rene Syler Monday on The Early Show. SNOW GLOBE: An 8-foot indoor/outdoor inflatable snowglobe with a snowman inside. It comes with four lights, four ground stakes, three tethers and an easy-to assemble fan that blows the snow around. Cost: $99. Available at www.homedepot.com. 2-1 LIGHT SHOW PROJECTOR: This weather-resistant projector puts on a 60-foot-wide magical show of dancing images across the front of your home. Images include shooting stars, floating balloons, flying witches and flying bats, making it suitable for other holidays as well. Cost: $69. Available at www.frontgate.com. "RUDOLPH" HOLOGRAPH: These retro-style holiday decorations are covered with more than 150 colored lights. Each character is 4 feet tall and filled in with a holographic material to make it as attractive in daylight as at night. Cost: $70-$100 each. Available at www.christmaslightsetc.com. SNOOPY HOLIDAY DOGHOUSE: This festive and colorful holographic yard art glows with 200 multi-colored lights. Dimensions: 48"H x 36"W x 2"D. Cost: $79.99. Available at www.greatoccasions.com. 3D GIFT BOXES: Make up a set of two or three presents from a choice that includes a 16" red box with 200 Super Bright Mini Lights, a 12" green box with 150 Super Bright Mini Lights, or a 10" gold box with 120 Super Bright Mini Lights. Cost: $44.98 for set of 2, or $89 for set of 3. Available at Home Depot stores nationwide or online at www.homedepot.com. EVERGREEN DISPLAY:. Built to stand up to inclement weather, each letter in the Noel sign is illuminated and backed with a metal frame. The whole display is wrapped tightly with bright, durable, 3,000-hour clear lights. Hang under the eaves or stake directly into the ground. "Noel" sign measures 30" x 80" and costs $199. Also available is a "Joy" sign (30" x 60") for $169. Available at www.grandinroad.com. PRE-LIT GARLAND AND WREATH: The nine-foot-long garland and 30" wreath are wrapped in twinkling, no-twist 3,000-hour miniature lights. Cost: garland, $39, and classic wreath, $49. Available at www.frontgate.com. PATHWAY TREES: Green boughs are covered with 100 3,000-hour mini-lights. Connect up to six trees end-to-end. Each is 18" diameter, 36" high. Cost: $59/set. Available at www.frontgate.com. SUPER MINI LIGHTS:: These 10,000-hour, break-resistant Super Mini Lights are twice as bright as standard mini bulbs and are rich in color. Each 25' strand has 50 securely locked bulbs spaced just 6" apart. Connect up to three strands end-to-end. Cost; $9.50. Available at www.frontgate.com. DANCING & SINGING SANTA: The five-foot-tall Singing & Dancing Santa Claus has a repertoire of five songs: "It's the Most Wonderful Time of the Year," "Up on the Housetop," "Winter Wonderland," "We Wish You a Merry Christmas" and "Jingle Bells." Operates with regular 120V A/C. Cost: $49.84. Available at www.walmart.com. UPSIDE-DOWN CHRISTMAS TREE: This tree has a weighted base, 3,700 lifelike PVC branch and 800 commercial-grade lights. It measures 84" tall with a 54" diameter and 12" wide base. Cost: $599.99. Available at www.hammacher.com. 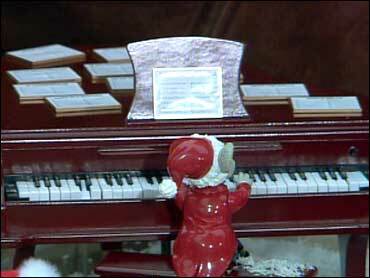 MAESTRO MOUSE: Using the newest technology, the mouse can play 30 holiday tunes on his baby grand piano. Change sheet music at any time to hear a different song. Battery-operated using 4 AA batteries, it measures approximately 9 1/4" wide. Cost: $100. Available at www.mrchristmas.com.